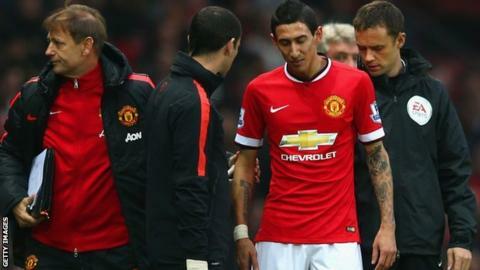 Manchester United midfielder Angel Di Maria has been ruled out of Tuesday's match with Stoke City after suffering an injury against Hull. The 26-year-old was withdrawn 13 minutes into the 3-0 victory with what appeared to be a hamstring issue. The £59.7m record signing was replaced by Ander Herrera. United manager Louis van Gaal said: "He shall be out at least on Tuesday. We have to wait to see. Maybe tomorrow we'll know more." Argentina international Di Maria missed games with hamstring problems at his previous club Real Madrid and adds to a list of injuries at Old Trafford. Defenders Jonny Evans, Luke Shaw, Phil Jones, Rafael and Daley Blind all missed the game against Hull because of injury. Striker Wayne Rooney received treatment late in the match at Old Trafford but Van Gaal said he would be available for the match with Stoke. Van Gaal said: "First he had a kick to his calf, I believe. "After that he had a problem with his knee but I don't think that it is too much to worry about because he said that he should play."